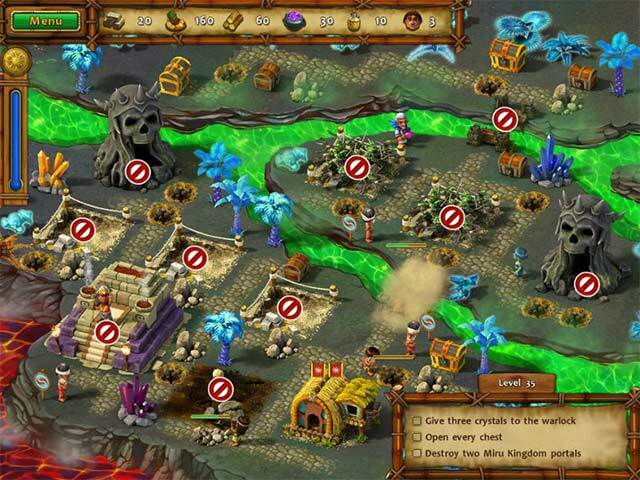 Control the destiny of the heroic ruler and help rebuild the homes and lives of his people. 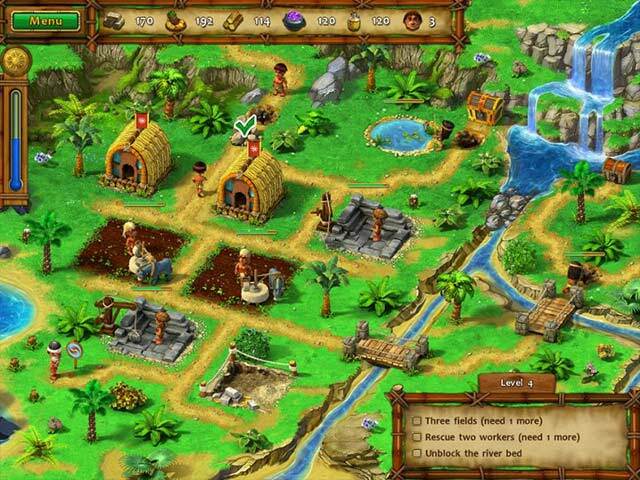 Gather food and other resources to complete tasks. Defend your people against evil henchmen and bizarre supernatural enemies. 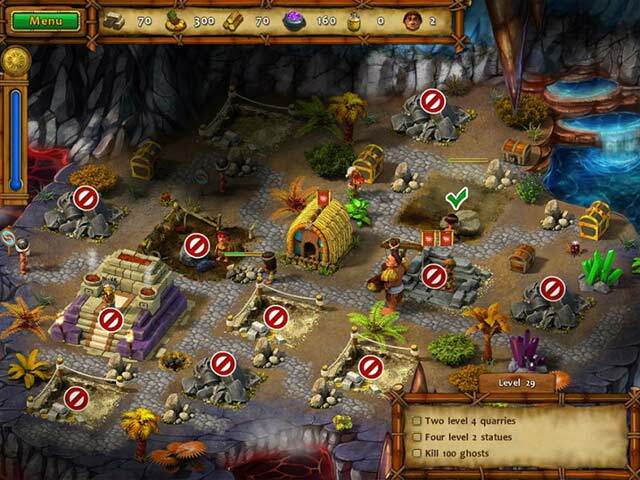 Strategize to complete tasks quickly and unlock achievements! Can you save your beloved and rebuild your land? 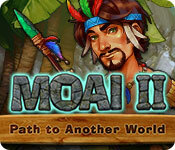 Moai II: Path to Another World is rated 3.7 out of 5 by 37. Rated 5 out of 5 by Bumbles2 from Absolutely brilliant...love it !!! This 2nd one is absolutely brilliant...I totally enjoyed playing this one and I hope they will bring out more like this. The story goes like this...Bright light has been kidnapped and its up to the Hero to travel through many areas to find her and to set her free. Each area has its challenges and tasks that need to be done before moving to the next level. Some of these challenges need to be thought out by using some strategy. This is such a delight to play. Kudo's to the developers...the artistry in this game is second to none... it is sharp and clear!! As far as the levels go you know exactly where you are going and what needs to be done to complete the task. The whole game is clear and concise and so much fun. You are missing a fun time by NOT playing this awesome game its just a total delight to play !!! Rated 5 out of 5 by flandscaper from Very Fun! Challanging too! Allot like the first but I was disappointed that there were only 40 levels, first edition had many many more!! It's a fun time/ resource management game while fighting off ghosts. A few things were different than in first edition, like a bakery where you could multiply food, but there really wasn't any explanation as to what this was for.. and it kept a worker busy the whole time. I like the addition of amulets that gave you boost depending upon which one you used, like (Weather Lords has) This game is quite similar to Weather Lords, Building the great Wall, Hercules, Gnomes, Rescue Team and Gardens Inc. ***If you like those game should should like this one too! I certainly do!! Rated 5 out of 5 by perrers3 from The timer is a GOOD thing I just wanted to respond to the reviews which say this game is not fun because the timer is too hard to beat. First, for me, this is exactly what makes the game fun: that it's not so simple that you can just play through it in the demo period. But second, there are ways to do it, you just have to find them. If you can't beat the timer, you can change strategy and find a way through. For me, this is the very essence of a puzzle game: figuring out what to do. Also, a free bonus tip for those who are stuck, though I was able to make it past the timer on quite a few levels before I realized it myself: check your backpack. Rated 5 out of 5 by Shamumu from Lots of Fun I thoroughly enjoyed this game. The timer is difficult but not impossible. Rated 5 out of 5 by _Frenchy_ from Artefacts Why, even if I finish the level on time and opened all chests, I don't have all the artefacts...can somebody help me please? Rated 5 out of 5 by tntgregor from Very fun time management game This game was great, it lasted a long time and getting gold was tough but not impossible. I haven't played the original game, but I may go back and try it. Rated 5 out of 5 by musicalbelle from Finally a good TM game! I read a lot of the reviews and felt compelled to write my own because this game is NOT too hard. If you are an avid TM game this will challenge you but it is not impossible to get gold. The music is the nicest I think I have ever heard in a TM game, very relaxing. I LOVE that every level has a bonus level counterpart. What a brilliant idea. If the bonus level is too hard to get with gold, wait until you have more artifacts to help you. Overall, the best game I've seen from Big Fish in quite a while. Rated 5 out of 5 by lacard from They did it again !! Loved the first Moai game. Took me a whole year of off and on playing to make gold stars and chisel all the statues but it was fun. This sequel looks great so far. Played the demo and bought it. The graphics are bright, cute, accurate, and easy to click. The little characters are so cute and hard working. Music sounds tropical matching the island type of environment. Character chatter is still cute and indicates what's going on. Took me awhile in the first Moai to figure that out. Game play is pretty much the same as the first Moai so far. What I enjoy about the Moai series is that buildings are built and swept for resources rather than running characters along roads to pick up items. Strategy is critical. The only thing I didn't like about the first Moai was clicking on the ghosts but I found on my re-plays that I was doing too much clicking and not building statues. Don't know how this one will work out but hopefully it will be as interesting to plan activities. I highly recommend this game to anyone with the perseverance to play through and go back for gold stars later. It's not for anyone easily discouraged. Rated 5 out of 5 by boogienites from Finally! A decent TM game I had just contacted BFG about the lack of TM games, and 2 days later .. ta dah!! I loved the first installation of this game, and the 2nd does not disappoint. I see some are upset about the timer, and I will admit, at first, I was like, "Oh no!!! Not another impossible TM game (one came out a few days ago that I quit after 6 levels#. I love a challenge, and this game delivers, but if you stay with it, the game will give you hours of fun. Yes, there are times I had to replay certain levels up the 3-4 times, but isn't that the point of TM? If it were easy to beat every level, why bother with TM and just play w/out the timer #not sure this game has that option). For those who can't seem to figure out how to beat a level, there are videos on U tube for each level. Looking forward to meeting the challenges on this game. Give me more of these BFG! !